The Young Entrepreneurs International Bootcamp India will send young entrepreneurs with an early stage startup to India in February 2019 to learn from the country’s best and brightest industry leaders. NSW Minister for Trade and Industry, Niall Blair, welcomed the announcement under the Government’s $1.6 million partnership between NSW and India to allow entrepreneurs greater access to markets and knowledge. “Young entrepreneurs will learn from India’s best and brightest, gaining direct access to global leaders in innovation and entrepreneurship who can guide their businesses in global technology markets,” Minister Blair said. “SSE is seeking out forty rising entrepreneurial stars from across NSW,” said Nick Kaye. 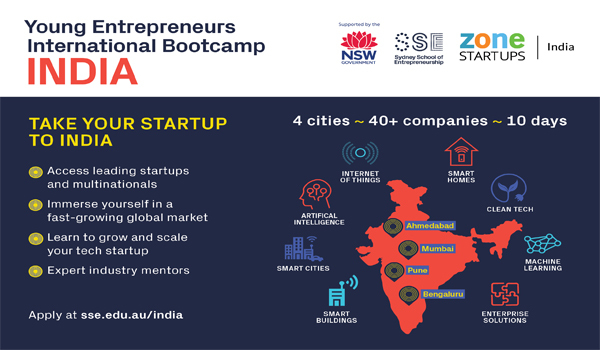 “Connecting next generation Australian entrepreneurs with 40+ globally successful Indian startups and multinationals, and specialist mentoring on scaling a global business, makes the sky the limit for creating high growth companies. 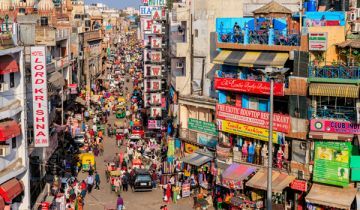 to joining the 10-day program to connect with India’s diverse startup ecosystem,” said Nick Kaye. Applications close 1 November 2018.